A group of out-of-work steelworkers living off of social welfare decides to try and make some quick cash by becoming strippers and baring it all. A comedy about a bunch of average guys becoming strippers? A movie like this doesn't exactly ring "best picture Oscar nomination." Well, "The Full Monty" sure was one of the nominees in 1998, and we will say right here, right now, it 100% deserved it. The 90's were a different time, good friends! This film is directed by Peter Cattaneo and was his first feature film as a director. It is written by Simon Beaufoy and was his first screenplay for a feature film. Though this was probably the high point of Cattaneo's film career, Beaufoy would go on to write screenplays for films like "Slumdog Millionaire," "127 Hours," and most recently, "Battle of the Sexes." It stars Robert Carlyle as Gaz, an unemployed former steelworker who tries to scrounge up money any way he can even if it means stealing steel girders from his old job to sell for scrap. Gaz has recently learned his wife is applying for sole custody of their son Nathan (William Snape) because he can no longer pay the child support he owes her. In order to make a quick buck, he decides to round up some former co-workers and put on a striptease show while charging 10 quid a head to watch. It doesn't matter that some of the guys in their group are too fat, too thin, too old, or too ugly because they are willing to offer what no other stripper club will: the full monty. It had been many, many years since we last watched "The Full Monty," but we always remembered really enjoying it. With our annual Oscar marathon upon us, we thought we would finally rewatch it for the first time in at least a decade. We always thought this was a funny film, but we don't know if we truly remember it being as side-splittingly comical as it is. This story is absolutely hilarious and is full of great dialogue and quippy, witty humor. We uproariously laughed for its entire runtime, and hardly a moment went by when we didn't need to wipe a tear away from our faces because we were chuckling so hard. The cast here is fantastic. Robert Carlyle is great as the leader of the group, and the rest of dance troupe, played by the likes of Mark Abby, Steve Huison, Tom Wilkinson, Paul Barber, and Hugo Speer, are equally fantastic. Each of them does a brilliant job in their own way, adding a different characteristic to this motley crew of average joe strippers. 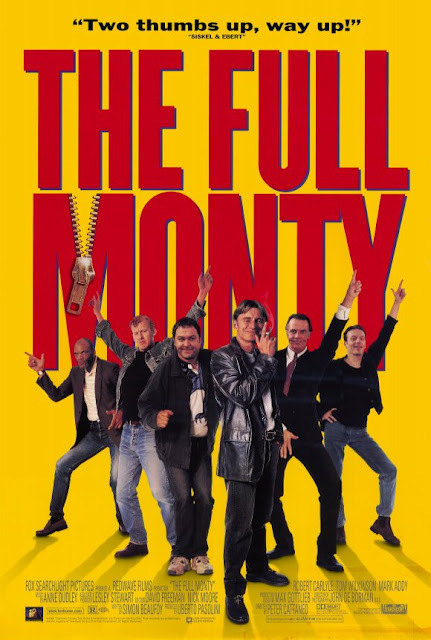 We absolutely love everything about "The Full Monty." Not only is it extraordinarily smart and entertaining, but it also has a lot of heart. Hell, it even has an underlying social commentary about the deterioration of the steel industry in England and how many once-thriving towns were completely ruined when one factory shuttered its doors. This is an exceptional underdog story that wound up being a surprise global box office sensation. It was released at a time when only five nominations for best picture were given. These nominees were often dominated by Hollywood powerhouses, but "The Full Monty" was an underdog Oscar contender that absolutely deserved its spot amongst the other four flicks. This is an incredibly good comedy that everyone should see at least once. Prepare to laugh often and prepare to laugh hard.